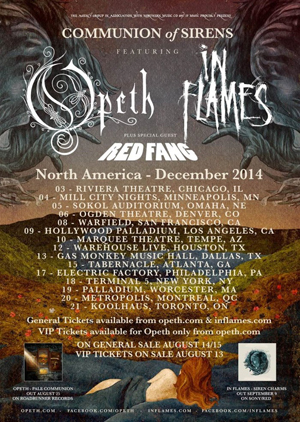 Two of Sweden's most respected and beloved rock exports —that'd be IN FLAMES and OPETH — will descend upon North America this December for a 15-date, co-headline tour that kicks off December 3 in Chicago and runs through December 21 in Toronto. RED FANG will serve as support. Tickets for the tour, dubbed "Communion Of Sirens", will go on sale Friday, August 15 at 10AM local time. "I met [OPETH guitarist] Mikael [Akerfeldt] for the first time in 1998 during the recording of OPETH's album My Arms, Your Hearse," recalls IN FLAMES frontman Anders Friden. "I was working in the studio and we've been friends ever since. Now 16 years more beautiful, we release albums in the same cycle and it's with great honor and pleasure that IN FLAMES share stage with our friends and fellow countrymen in OPETH." Akerfeldt concurred, saying, "We are delighted to return to North America to tour our latest album Pale Communion. This will be the first of two North American Tours and the fact that we are teaming up with our old friends IN FLAMES for this co-headline tour means that we can get to play some large venues and present our new stage show. I am also looking forward to drinking expensive whiskey with Anders on his account." IN FLAMES will release their eleventh album, Siren Charms on September 9 via Sony/RED. The song "Everything's Gone" has taken off at radio and will be available on August 19 as an instant download track for fans who pre-order Siren Charms. "Through Oblivion" and "Rusted Nail" are also instant download tracks that are available now. Fans can pre-order Siren Charms via the iTunes Store and also at MerchNow, where there are numerous exclusive bundles and versions of the new album. 12/18 - Terminal 5 - New York, N.Y.